We have added some new options to our Custom Information Questions. 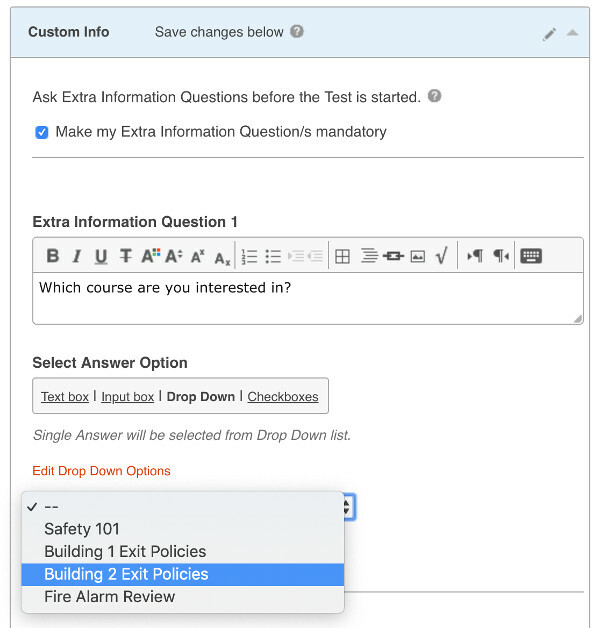 Custom Information Questions allow you to gather information about your Test Takers before they start your exam. These questions are a great way to gather information such as, Customer leads, Which department they belong to or Which courses they have completed or wish to take, the list goes on. You can also require these Questions are mandatory, to ensure Test Takers do not skip these. This information can be Viewed in ClassMarker, Exported with Quiz results and retrieved with our API and Webhooks options. Now you can easily have one of more of the Answers, added to your Custom Certificates. These can include Course Codes, Employee IDs, Student Numbers, Serial Numbers, Registration Numbers, License Numbers and more! Register Here and begin today! How do I Create Online Certification Exams? How do I Create a Business Questionnaire? How do I Write Great Online Exams? How do I Set Passing Mark?